These are great gloomy day pick-me-uppers. Whether it’s scorching hot in the summer, or humid because of the random rain pour, one closet lazy-day staple we can always count on is the easy-breezy cotton dress. It’s an easy-to-style go-to look for random trips to the mall, errand Saturdays, and even Sunday mass. You can layer it, wear on its own, and take from the beach to city, so what’s not to love? When it comes to styling, you can pair it with absolutely any type of footwear. But here's what we suggest: rocking it with the equally versatile slip-on sneakers. We found not just one, but six, fun, comfortable, classy, and of course, stylish pairs that can punch up your plain mini frocks, any day. Meet the newest offerings from Lacoste Footwear, the Fabian and the Orane. Both styles are made with sports-grade insole and rubber soles to provide maximum comfort, tastefully peppered with tiny floral patterns for a subtle, yet punchy presence, and finished off with none other than the Lacoste Croc. Go for the Fabian complete with the shoe laces if you want a slightly rugged look, and with the Orane if you want the cleaner and more feminine pick. The Fabian and the Orane comes in three patriotic and uber versatile colors: red, white, and blue. The best part? While you just found your cotton dress a new partner-in-crime, you can also wear these slip-on sneakers with skirts, jeans, and shorts! Give your favorite pair of white sneakers a rest and go for something exciting for a change. Go ahead, take your pick, and start fighting off the gloomy days, one stride at a time. 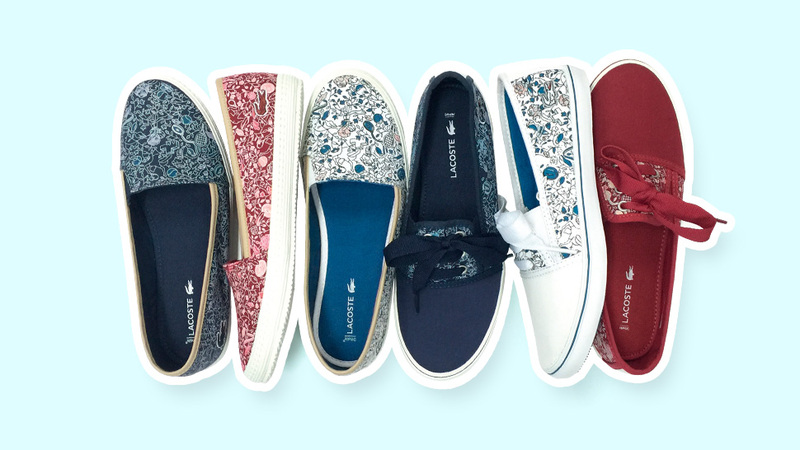 Visit www.pentstarsports.com to find out about Lacoste Floral and other footwear collection.